Let's get one thing straight. 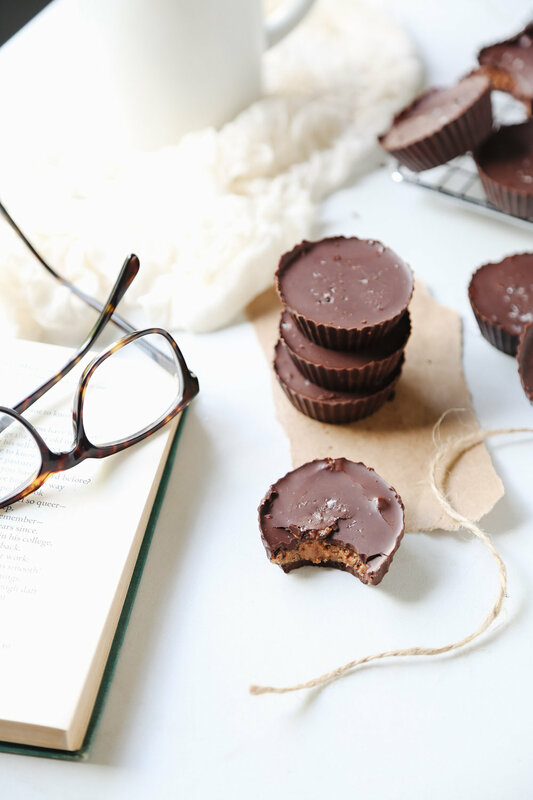 These peanut butter cups taste like anything but a health food. 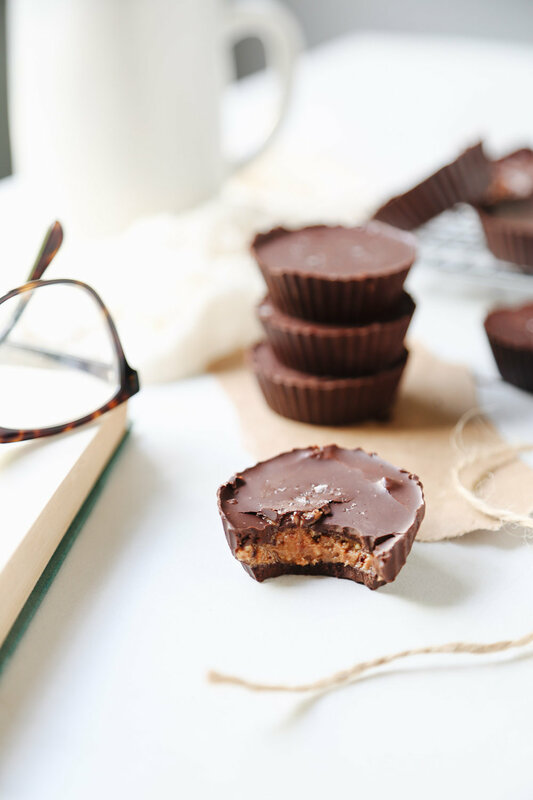 With a title like "Vegan Peanut Butter Cups Recipe (refined-sugar, gluten + dairy free)" I know you're thinking it. 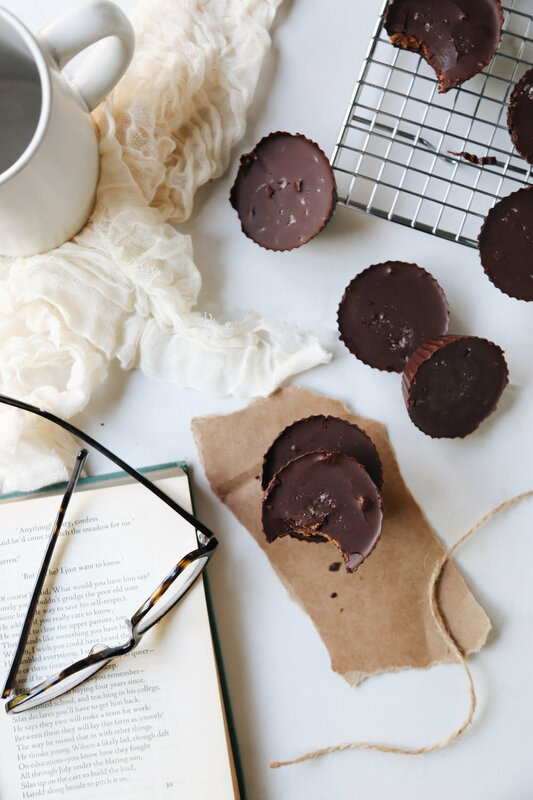 You're rolling your eyes at me right now, saying there's no way that a recipe without any of the fun stuff (aka sugar and gluten) could possibly taste like anything other than cardboard. But it only takes 4 ingredients for me to prove you wrong! Trust me, I get it. You're used to me posting sweet treat after sweet treat filled to the brim with all kinds of sugary goodness. I mean, is it even a meal if dessert doesn't happen?! Not in my book! However, I realized that over the holidays the sugar consumption might have gotten slightly out of hand. So, in an effort, to get things back under control, we've been attempting to go refined-sugar free (emphasis on the attempting part). To say it's been easy would be a complete and total lie. I ADORE cookies, chocolate and ice cream and want them almost hourly (No joke.). However, I was also surprised to realize how many sweet treats I already actually enjoyed that are refined-sugar free or naturally sweetened and are real, whole foods (I have no problem with GF/SF/DF things, but I DO have a problem with replacing things with a fake or chemical version of it. Trust me, at that point you're better off just eating the real thing!). 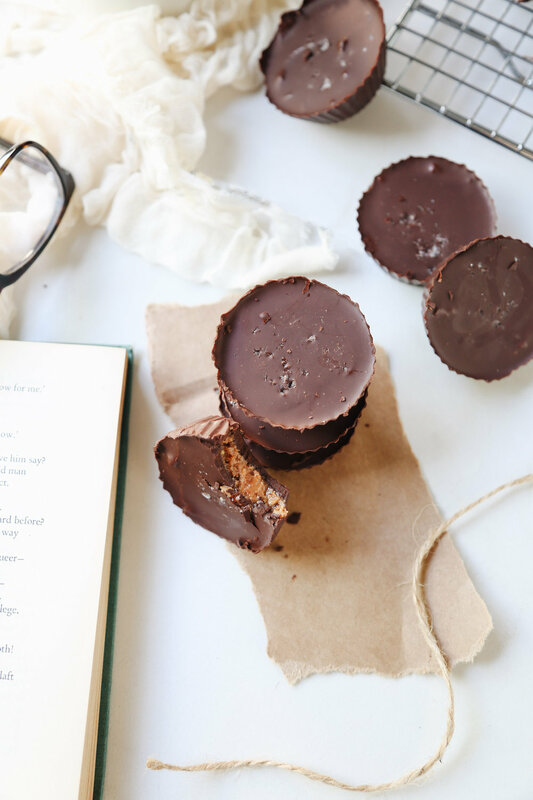 I was also surprised to realize how easy it was to makeover some of my favorite treats into better, healthier versions. 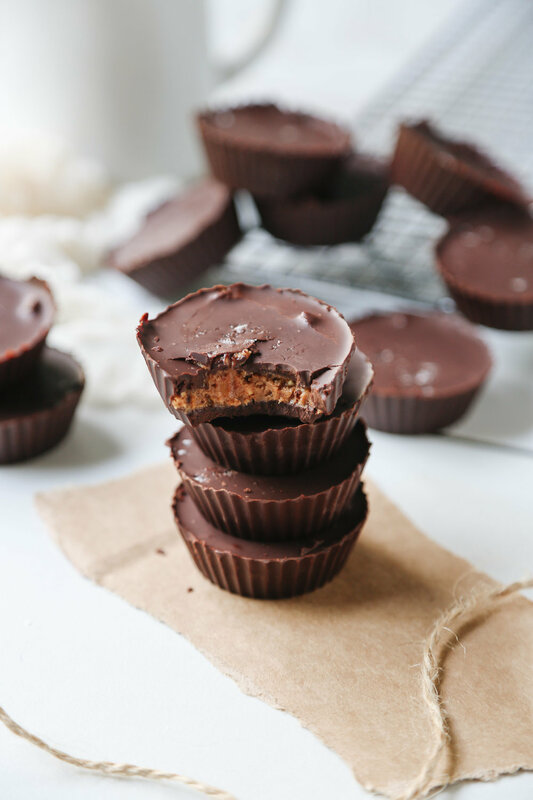 Case in point, these peanut butter cups. 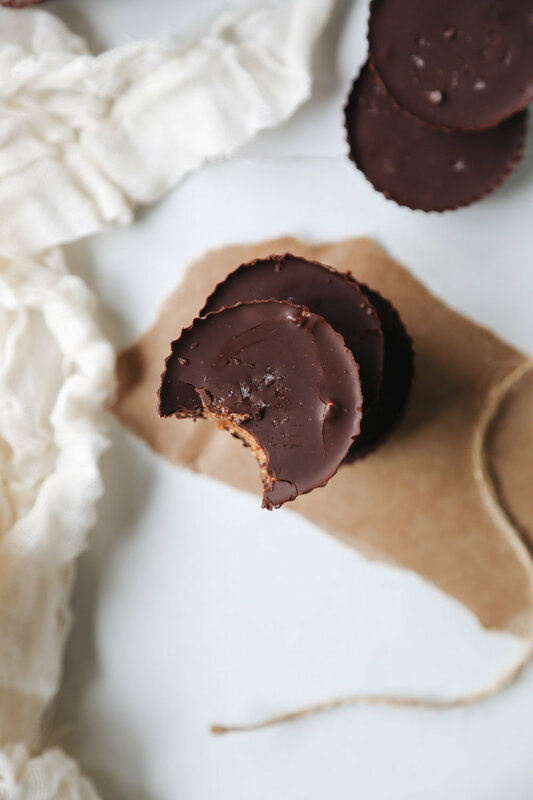 I've always loved making my own peanut butter cups. 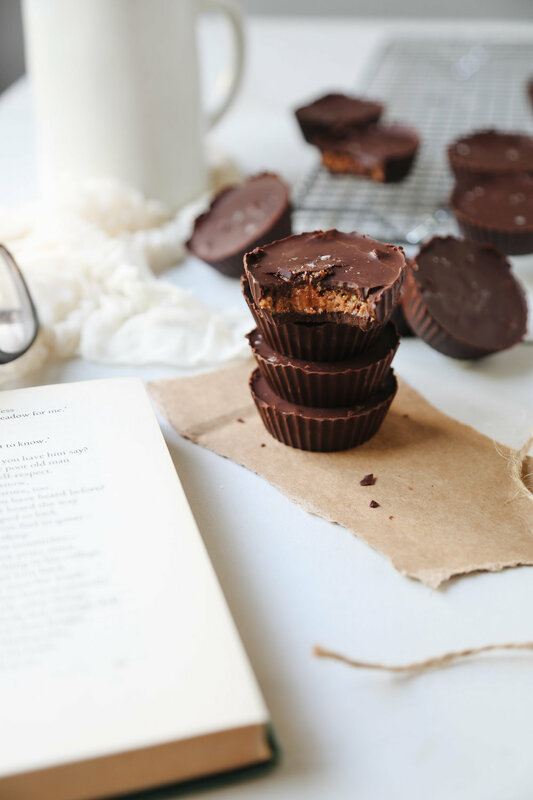 They're an easy thing to make, they don't require tons of ingredients, and peanut butter is protein, so it basically makes peanut butter cups a health food, right?! Once we decided to (mostly) give up refined sugars, I knew I'd have to give my regular recipe a makeover. It was a surprisingly easy task and it turns out, I like this new and improved version even better than my original recipe. 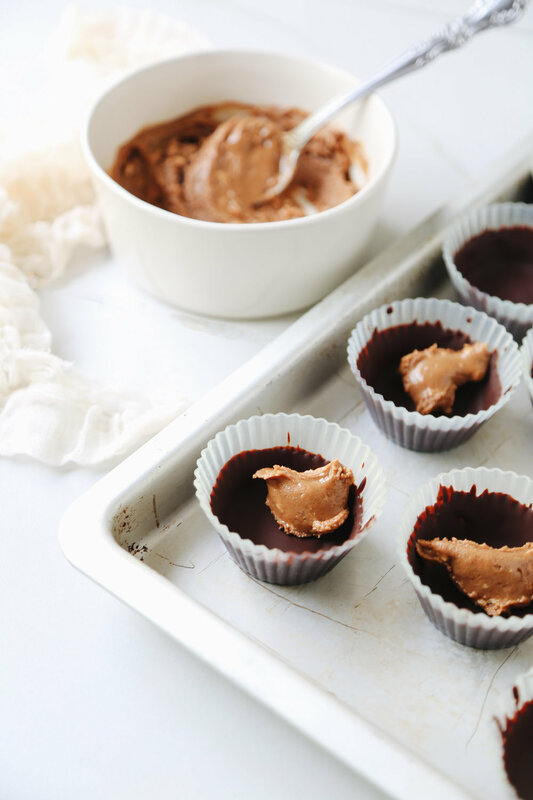 I haven't made these with anything but peanut butter yet, but I plan to try them with almond, cashew and/or pecan butter next, at which point, I'll probably want to consume nothing else for the rest of my life (I mean, hello! 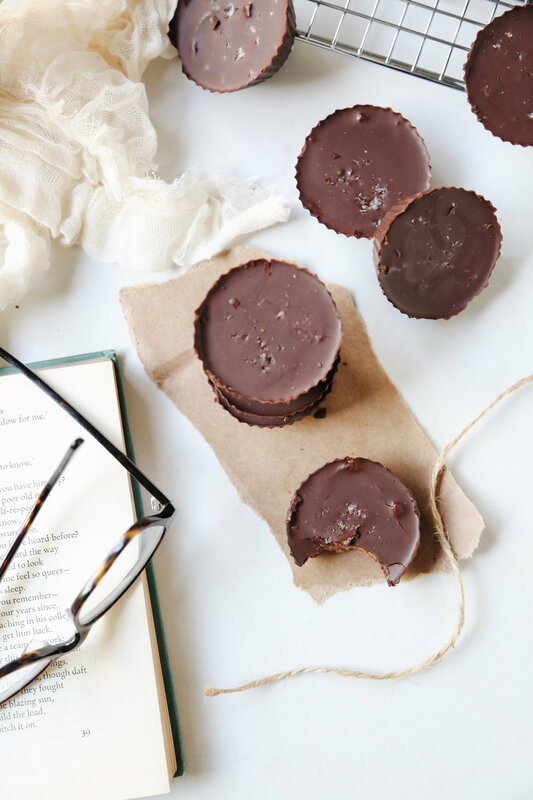 A healthy pecan butter cup??! Sign me up!). Have you ever gone refined-sugar free? If so, what were some of your favorite treats? I'm thinking of doing a round-up post of all of our favorites. Let me know if that's something you'd like to see. Line a muffin tin with liners, or, if you’re using re-usable liners, lay them out on a baking tray. Set aside. 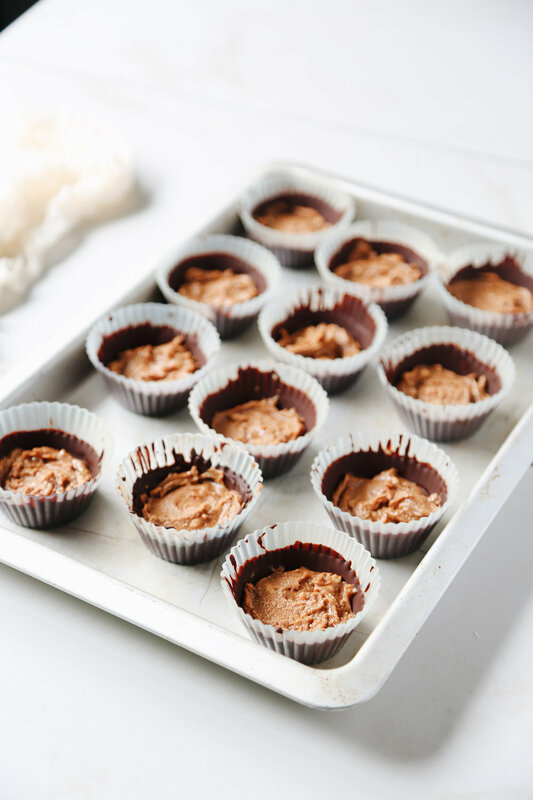 In a small saucepan, set over low heat, combine the chocolate with 1 tablespoon of the coconut oil, and stir until melted, about 1-2 minutes. Remove from heat. Use a pastry brush or spoon to line the bottom and sides of the muffin tins with chocolate. Place the pan in the freezer until the chocolate is hard, about 15 minutes. Repeat the process once more, then let the cups set in the freezer while you make the filling. 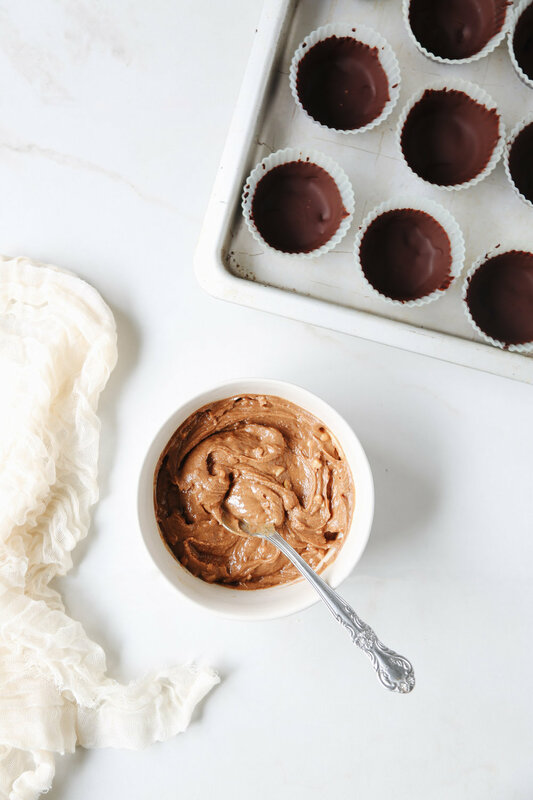 To make the filling, stir together the remaining tablespoon of coconut oil with the peanut butter and maple syrup until well combined. 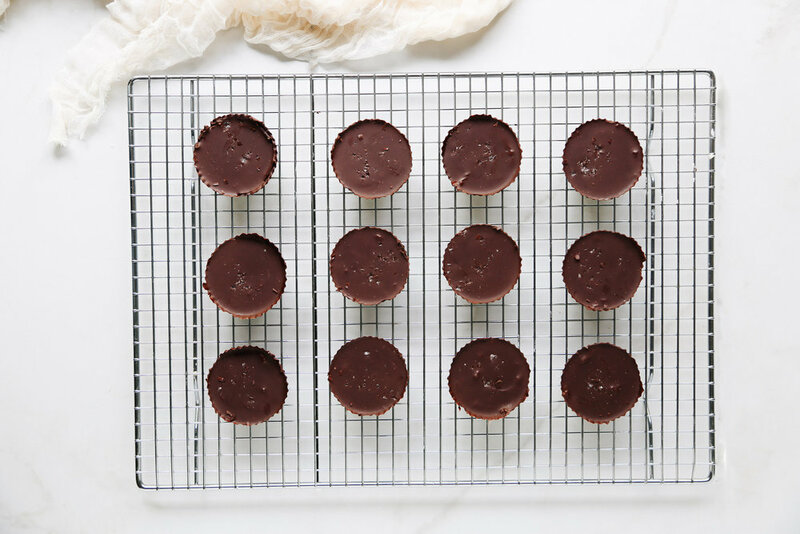 Spread about 2 teaspoons of filling into each chocolate cup, then cover with additional chocolate (about 1 teaspoon should do the trick) and sprinkle with salt (if desired). 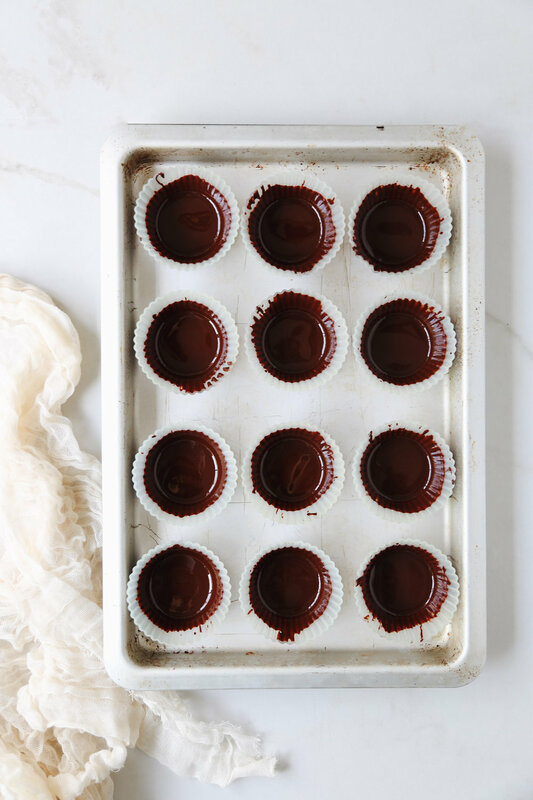 Once all cups are filled, place the tray back in the freezer, until the chocolate is solid, at least 30-60 minutes, then remove from the liners and place in a storage container. I like to keep mine stored in the refrigerator, but, if you like your peanut butter cups really cold, keep them in the freezer. Enjoy!